Bake biscuits as directed on package, baking until golden brown. Remove from oven and allow to cool a couple minutes. Using a serrated bread knife, cut biscuits in half horizontally. Set aside. In large non-stick skillet, cook scrambled egg mixture. When done, cover and set aside. On baking sheet, place biscuit halves cut side up. On bottom half of each biscuit, place a slice of ham, cutting or folding to fit. On top half, place a slice of Munster cheese. 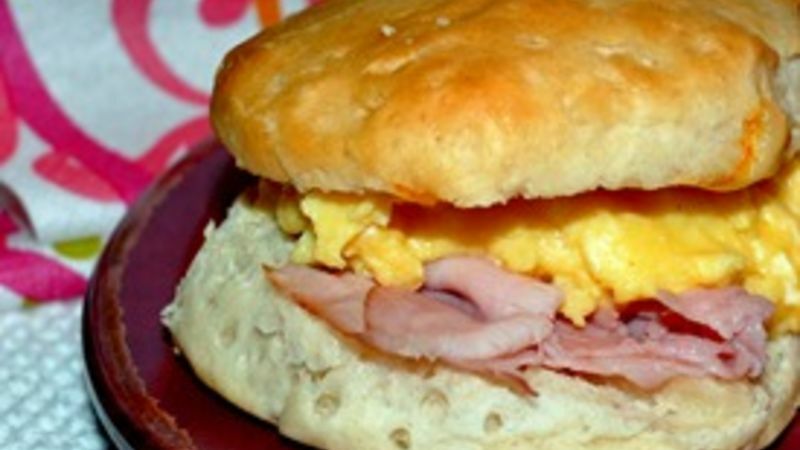 Set broiler on high, and broil sheet of biscuits for two minutes, or until ham is warm and cheese is melted. Remove biscuits from broiler. Immediately scoop about 1/8 cup of scrambled egg mixture onto ham slice. (Tip: A cookie scoop works well for this step.) Add top biscuit to form sandwich. Repeat for remaining sandwiches. Serve immediately with favorite condiments -- barbecue sauce, mayo, ranch dressing or ketchup -- if desired.